Come and join us on the beautiful Portuguese island of Madeira. Nicknamed ‘Pearl or Floating Garden of the Atlantic’, this sub-tropical destination is ideal for a relaxing Sun break. With a heritage rich in culture and natural beauty, this charming island has something for all to enjoy. Located north of the Canaries, Madeira is arguably the Atlantic’s most beautiful island; with quite some spectacular scenery! Look out for different species of birds, trees, flowers, eucalyptus groves, cultivated terraces and even mini banana plantations. Bougainvillea, fuchsia and gorgeous lilac jacaranda all help enhance the nicknames of the island and set the scene for a relaxing holiday. Our hotel is in the quiet town of Machico Bay, the oldest in Madeira and was the first capital until unification with Funchal and the rest of the island. It is also where the first settlers set foot on the island in 1420. Today, this charming town is away from the tourist track and is home to one of the few of beaches that can be found on the island. Machico beach is an artificial man made beach, where the sand has been imported from Morocco, and it strikes the perfect contrast with the surrounding green valley. Smaller than the well-known beach in Calheta, it stretches for 125 meters. It boasts a historic waterfront and a spectacular promenade lined with a number of restaurants and bars where we can try some delicious local food. A holiday to Madeira would be incomplete without a visit into the picturesque capital of Funchal, just a 30 minute drive from our hotel. Here we can find its famous colourful gardens and cobbled streets of the old town. A few other excursions not to be missed include the delightful village of Santana. 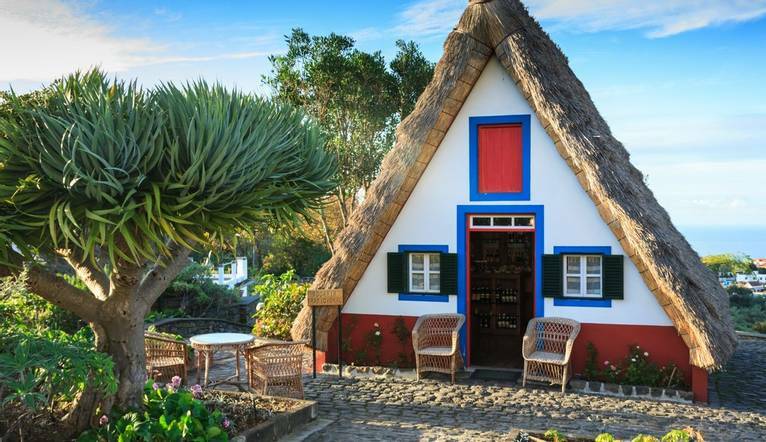 Found on the north coast, the village is characterised by its traditional stone built triangular houses with thatched roofs made of straw and traditional way of life. Don’t forget to take the fun toboggan ride down from the village of Monte and even visit Porto Moniz with its beautiful natural swimming pools and striking surrounds. Grab a fresh fish or shellfish lunch that this area is famous for. Smooth booking experience with flights identified from my local airport. Excellent Tour Leader who brought the group together and he cultivated humour which oiled the group dynamics so that I felt everyone enjoyed the holiday. Our hotel is ideally located just minutes from the golden sandy beach, and close to the quiet town centre. Facilities at the hotel include a restaurant offering beautiful views of Machico Bay, bar, pool bar, outdoor heated swimming pool, tennis court, games room and free Wi-Fi in the reception. All rooms are attractively decorated and come with air conditioning, TV, direct dial telephone and safe (extra charge). Transfer time from Madeira Airport to Dom Pedro Madeira Hotel is approximately 15 minutes.